Here’s the guest post I wrote over on Nick Throlson’s blog. Inevitably, at some point in your life you’ve had a head-slapping, stop in your tracks moment where you say to yourself, “Why didn’t I think of that???”. Every year thousands of creative entrepreneurs come up with a new product, or service, or website idea that makes it big, earning the creator either a giant paycheck or boatload of publicity, or both. So why isn’t that person you? It can be. Now is the time to act! Still not ready? Maybe you just need to hear about some people who have done it in order to get your juices flowing. Here’s a run down of some of those people who took their ideas (crazy as they may seem) and turned them into gold. Jason Sadler is another one of those Web-entrepreneurs that have taken a silly or creative idea and turned it into Web gold! Jason created IwearYourShirt.com, a site that features him wearing a new shirt every day, each one sponsored by a new advertiser. In 2009 Jason successfully sold 365-days of sponsored shirt wearing, earning him just under $70,000.Yes, you read that right. Jason made almost $70,000 for wearing a different t-shirt every day. Doesn’t sound so silly now, does it? Kyle MacDonald bartered his way from a single red paperclip to a house in a series of online trades over the course of a year. That’s right, he used the power of the Internet and a creative idea to trade something of almost zero value, for something (a house) of actual real value. Alex Tew is the guy who came up with The Million Dollar Home Page. I was proud to take the stage at the largest Affiliate Summit to date to deliver my keynote speech. Here is the recording from the live stream in case you missed it. If you were there, you would have received a free copy of my book! Lisa Barone covered it in GREAT detail on her blog in written form if you don’t have time for the video. Get Your Book In The Mail? Take A Pic! I’d love to have a pic of you with the book when you get it. Feel free to either send it to me, or post it online on Facebook or Flickr or wherever. Just let me know somehow when you do. Thanks! Here’s Tom Guard with his copy. For the past year I’ve been neck deep in the book writing and marketing business. I’ve learned a lot. I’ve learned all about how the publishing business works, and let me tell you, it’s pretty complex. I could go on for days about it all, and I will in future posts. But today I want to talk about why I think it’s important for you to go to your local bookstore. Sure, buying online is easy. Jeff Bezos created Amazon because he realized that people really didn’t want to have to drive to the store to buy a book. It would be much simpler to just go online and have it shipped directly to your house. And he was right in parts. But I’m a big fan of bookstores. There’s an experience you get when you visit one that you cannot get by purchasing online. As a rule, if I see a Borders or a Barnes & Noble I always try to stop in just to have a look around. The first place I go is the the business book section of course. I love to see all the different books stacked in the display and how they all look mashed together. I scan them and look for the titles and covers that draw my eye. I find it fascinating how they choose to put some books forward facing, and others just showing the spine. Then I pick them up and feel them; then open them up and scan the contents. Smell them. Nothing like the smell of a fresh book! This is a totally different experience than buying online, and in my opinion, much better. There’s a feeling you get in a bookstore that you cannot get by surfing online. You know what I’m talking about. It’s like you’re in a library full of countless amounts of knowledge and entertainment. So much so that you feel empowered by it all. I do at least. Next time you’re in the vicinity of a bookstore, stop in. Browse around and NOT just in your favorite category. I like to challenge myself by reading books that I know nothing about. Fiction and non-fiction. It helps me stay connected with things that are happening outside my industry. It also helps me generate a bunch of ideas. I don’t want to see the day when there aren’t any more actual stores to go into. How do we make that happen? It’s all about support. You can take your first step tomorrow to help. Look up a local bookstore near you and go. Have You Ever Been “Broganified”? Broganified: The act of Chris Brogan mentioning your blog on his Twitter or on his blog, which causes your server to crash to the ground with extreme prejudice. About a month or so ago I graciously received a Tweet and blog post from friend Chris Brogan about a video I did. Within moments, my server was brought to it’s knees because too many people tried to visit the blog. In other words… I was Broganified!!! So I had to take matters into my own hands so it wouldn’t happen again. I went out and got a brand new server. One that is five times faster than the old one, with more memory and super-duper power. Take that Brogan! I dare you to try it again! All kidding aside. This is a valuable lesson for you as well. If you want to play in the big leagues and get big mentions from people like Chris, you’re going to need to invest in hosting that can handle it. I always say that great hosting to me is like the water in a water park. You MUST have it. Without the water, there’s no water slides. Without the best hosting, there’s no way you can run your Web business to the utmost capability. When I first started out with my own hosting about 10-years ago, I chose a cheap hosting company. Fine, it was great, I didn’t need a lot of bandwidth or power. But guess what happened? After a while I started to make some serious money from my websites. I had over 60 websites going at once. Then one day all of my sites disappeared. And they were down for 3-weeks. 3 weeks! Why? Because, as I later found out, I was hosting with a guy who had a bunch of his servers in his garage! He went on vacation for a month and lost power and didn’t care. Didn’t answer emails, phone calls, etc… My sites, all of them, and email, sat dead for 3-weeks. I literally lost 5 figures in profit. That was the last day I went cheap with hosting. Since that time, I’ve way overpaid for hosting with Rackspace (my own dedicated server) and now I’m with LiquidWeb (another dedicated server). If you’re just starting out, go ahead and go with hosting that is less expensive. You’re not going to need a lot, but don’t hesitate to upgrade when you need it. Otherwise, you may find yourself Broganified as well. If you’ve never seen Jake Shimabukuro play the ukulele, then watch this video. He’s amazing. Now that’s talent. Are you wow’d? Of course you are. And you pay attention to him because of his talent. Makes sense, right? But what a lot of people don’t realize, or want to realize, is that someone like Jake didn’t just become so talented overnight. My point is, the attention he now gets is not for lack of effort. There is no overnight success as Chris Brogan points out. This is another theme I talk about in the book. Jake started to play when he was four-years-old. Can you imagine how many countless hours he’s spent practicing? It didn’t happen overnight. He didn’t get lucky and wake up one day somehow knowing how to play that good. You want attention? One way to to get it is to put the work in and practice. Then remember to go do something remarkable. Sometimes, in order to get someone’s attention, you have to do something that is gross. Perhaps a White Castle smelling candle fits that bill? It definitely makes you say “Ewwwwwww”. Or if it doesn’t, you’re intrigued and you WANT to smell it. Either way, the point is, it gets your attention. Marketing win. Why does this work? Because it’s different. What can you be doing in your business that makes people say “Ewwwwwwwww!”? You should figure that out before your competitor does. In the book I write quite a bit about this debate. It’s quite obvious that from a sales and marketing perspective, the Snuggie won. 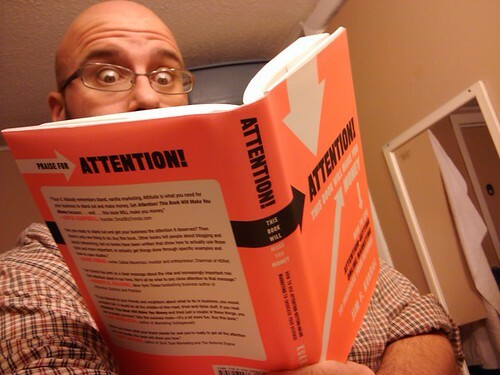 As you’ll read when the book comes out, the reason why comes down to marketing and attention. Mo Rocca recently profiled both companies, sitting down the founders of each. It’s Snuggie Vs. Slanket: The Great Sleeved Blanket Debate. Just submitted my list of blurbs for the back cover of the book. Here they are. In no order of importance. Thanks to all of these amazing people for their submissions. I will be asking many more of you for blurbs soon. So if you haven’t heard from me, you probably will. Well, the book is done and sent to the publisher and the release date is August 2010! I’d like to thank you all for stopping by, especially if you were a legacy reader from the old blog at BlendThisBook.com (the previous book title and blog). As you can see, this new domain is the new central hub for the book. What to expect now? Well, it’s time to crank my marketing campaign for the book into full gear. You’ll continue to see this site/blog change over the next month. I’ll be adding new offers, contests, and fun! Oh yeah, and I’ll try to get your attention too! Please consider joining the Facebook fan page for the book (on the right). More soon… You excited???? I am!!! !